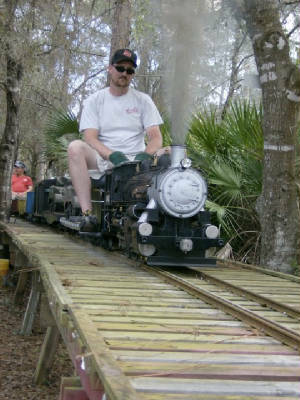 Our 7 1⁄2 - inch gauge live steam USRA 0-6-0 Switch Engine is offered as a completed ready-to-run locomotive chassis-on-air. We fully machine, paint or plate and assemble all of the castings and parts required to build a completed, working 0-6-0 locomotive "chassis-on-air." USRA 0-6-0 Switch Engine chassis ready for boiler mounting. Click to enlarge. Overall Length of Frame & Pilot Beam: 49 7/8"
This stage of locomotive completion is what we call a chassis-on-air. The fully machined, painted, plated and assembled chassis-on-air can actually be "run" for testing or demonstration purposes by supplying compressed air to the cylinders. Testing the completed chassis by running it on compressed air confirms that all of the machine work and assembly of the locomotive chassis has been performed correctly before you move on to the next phase of construction. In addition to providing you with a chassis on air, we can also provide you with a completed and pressure tested boiler. We can then put you in contact with a number of other qualified suppliers who specialize in a variety of additional items needed to complete your locomotive. Their offerings include everything from injectors, check valves, safety valves, water gauges, pressure gauges, pumps, hand rail components, etc., to completed tender tanks and even ready-to-run tenders. We realize that many first time builders get bogged down with the tedious precision machine work required to build their locomotive chassis. Consequently, we offer a solution that gives builders a "running" head start on their locomotive building project. Our 0-6-0 Switch Engine is designed to put a high quality, CNC-machined chassis within the reach of hobbyists without requiring them to have either extensive machining experience or as elaborately equipped machine shops. This approach allows you to custom finish and detail the rest of the locomotive and tender according to the railroad that you want to model after and your own desires.